Coaxial video shorting hairpin. Taps on back - (red to center conductor, black to shield). Male plugs. ADC CP1143. Trompeter brand 50 ohm patch cord. Patch to patch plug. 12"L, RG-58A/U. NSN: 5995-00-290-1208. ADL coaxial video shorting hairpin. AdC - hairpin without tap. 9/16" x 1-3/16" x 3-1/2". 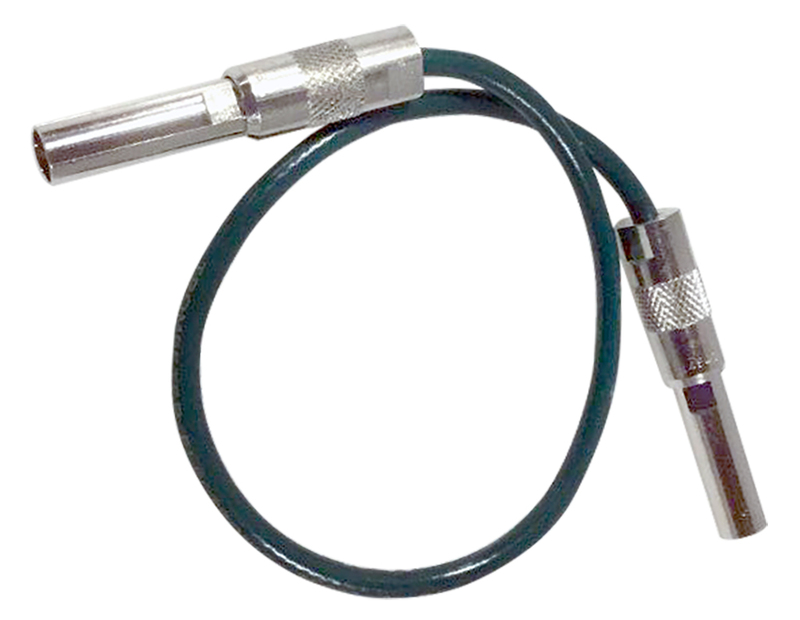 Coaxial video trimm connector, shorting hairpin with "BNC" tap. 1-3/16" x 13/16"H x 3-3/4"L.
Coaxial video female panel jack. Heavy gold plate. Fits 0.263"D coax cable or smaller. 1/2" x 3-1/8"L. ADC D15659. New!! Coaxial video female panel jack same as left except used. Pigtail attached. 1/2" x 3-1/8"L.
Video patch cable assembly. BK2VX. 28-3/4" long. Coaxial video female panel jack. Silver body, gold contacts. Kings coaxial plug tip. 93 ohm. 0.377" O.D. Western Electric coaxial video plug to "BNC" female. A very high quality adapter to convert patch bay to "BNC". Gold plated, PTFE dielectric. 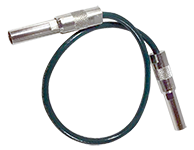 Trompeter "BNC" Jack to coaxial video jack. 3W adapter bulkhead mount. 75 ohm WE center pin. 0.090".